That’s just one of the most used lines in movies where the characters use two-way radios. Now it’s time to experience that kind of coolness too! A two-way radio is usually used when hunting in groups. It’s a useful means of communication when you’re miles apart while stalking your prey. Also, it’s more reliable than cellphones because there isn’t always a mobile coverage in the wilderness. Shopping for the best two-way radios requires you to consider a lot of features. We’ll guide you to choosing your first radio and introduce you to some of the technicalities surrounding the use of the two-way radios. All 22 GMRS channels, plus 28 extra channels. 142 privacy codes. Not all two-way radios are created equal. Thus, it’s up to you to be well-acquainted with the features of your ideal radio. Most two-way radios claim a maximum range of 25-35 miles. But this is only applicable when there are no physical interferences like in open areas. When using the radio in the woods, the optimal range you can get is 2-3 miles. The antenna length is necessary when considering the range. The general rule is the longer the antenna, the better the reception. This is due to the higher effective radiated power. Look for a radio with its antenna close to the length of the radio. If not, check if you can add an external antenna. Power can boost your range for a specific amount of time. The high wattage used for this feature drains the battery, so it's better to use it when in emergency situations. FRS radios can give you a max range of 5-6 miles for a half-watt usage. On the other hand, the GMRS radios can give you ranges of 8-25 miles for a max power output of up to 50 watts. However, they can be expensive. Two-way radios can be FRS, GMRS or a mixture of both. FRS stands for Family Radio Service and can transmit to a total of 14 or 22 channels depending on the model. This type operates on a half-watt and enough for most purposes. GMRS stands or General Mobile Radio Service and can provide up to 22 channels. This runs on 1-2 watts and requires a license to use. If you’re in an area with a lot of people using two-way radios, there are chances that you may hear interferences in all of the channels. Radios that are equipped with privacy codes make it possible for you to interact with minimal chatter. Even if you’re talking under a code, this doesn’t mean that your conversation is private. For instance, if a stranger is on the same channel with you, but has their privacy code feature turned off, they would be able to hear you. Also, if a stranger randomly enters the same channel and the same code, they can hear and talk with you. VOX or Voice-Activated Talking allows a hands-free operation especially when you have your hands full with something. Two-way radios may be powered by alkaline (e.g. AA or AAA) or rechargeable batteries (e.g. NiMH). We recommend that you buy a radio that can use both. It would also be wise if your ideal model has an included solar charger when you spend more hours outdoors. A two-way radio is better if it’s more than just a communication device. It should be able to scan weather alerts from NOAA so that you can be prepared hours before the impending inclement weather. You can prevent an accidental change in the preset settings when you set in this mode. This allows hands-free operation so you can take calls without having to stop to configure your radio. The Motorola is an established company known for manufacturing walkie-talkies since World War II. The Motorola MH230R is an inexpensive two-way radio, and some of its features are also found in more expensive models. This radio has an ergonomic design and fits into your hand. This two-way radio supports both FRS and GMRS frequencies to give you access to its 22 channels. Each channel has 121 privacy codes. One of this radio's main features is its 11 weather channels, and seven of them are NOAA with alert features. You can expect a range up to 3 miles when you’re out in the woods or areas with heavy interference. The Motorola gives more privacy than any other brand through their Quiet Talk function which only enables Motorola users to communicate with each other with minimum interference. When communicating with a group, you can use the call tone feature (allows ten different call tones) to differentiate each radio. The MH230R allows hands-free operation with its iVOX feature. It also allows multiple battery types. The radio can last 10 hours with three AAA batteries while 8 hours for a rechargeable NiMH battery. There’s also a mini-USB port found on the unit for more options in recharging. The battery life of the radio may vary. More often, it will not last up to 8 or 10 hours of continuous usage. Another thing to note is the absence of headset jack, unlike other brands. Also, USB cable for charging purposes is sold separately. Every package of this pair comes with two belt clips, a dual charger, a charging adapter, and two NiMH battery packs. 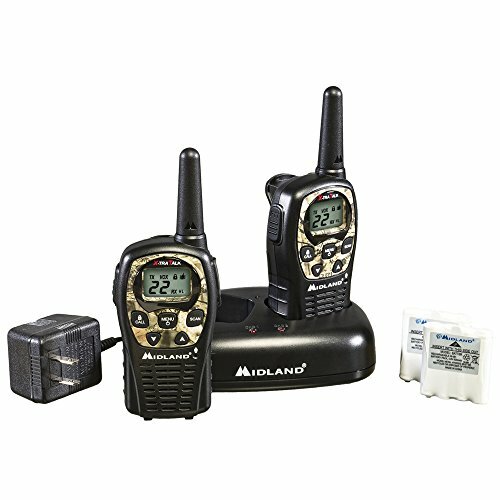 What makes this pair of two-way radios a little bit more expensive than others is the number of channels it can provide. It has the standard 22 channels plus 28 more for extra privacy. Indeed, this is your best option for any outdoor activity. The GXT1000VP4 has a channel scan feature to check for empty channels. There are 142 privacy codes for each channel, so there's a total of 5560 channel options to choose from. This two-way radio has an auto squelch feature to remove background noise. Another useful feature is the whisper function which allows you to speak very lowly, but others can still hear you loud and clear. Ten different call tones will notify you of an incoming call when communicating with a group. This radio can make you directly call someone in your group without alerting others. Its silent and vibrate operation mode ensure that you can work quietly. The keypad lock feature will prevent an accidental change in your settings. This two-way radio also allows hands-free operation with its headset jack and eVOX set in nine sensitivity levels. You can pick up nearest weather alerts and also other vital information such as fire, landslide, etc. through the ‘All Hazard Alert’ feature. During emergency situations, you can use the SOS feature to send distress signals. A GXT1000VP4 is powered by a rechargeable battery or by four disposable AA batteries. There are high, med, and low power options to conserve battery life. What comes in the box aside from the two radios are the belt clips, charging stand, NiMH battery packs, headsets, AC adapter, and DC adapter. This radio has limited charging options. If you’re not for disposable batteries, you will have to use the included charging stand. Also, you may experience some battery life issues such as the radio doesn’t last as long as advertised. 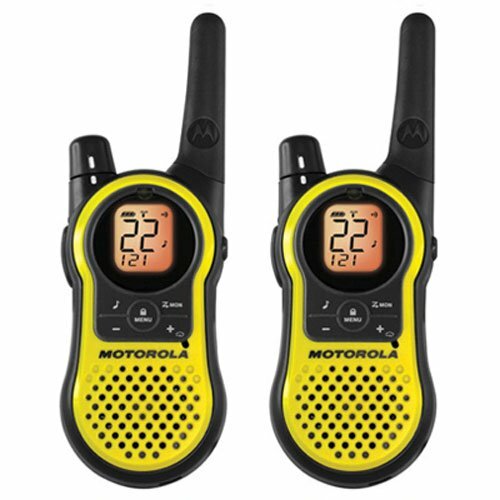 This is a basic two-way radio sold in pairs. It’s available in two designs: black and camouflage. We recommend this radio if you’re looking for cheaper options but has features available in other premium-priced radios. The LXT535VP3 shares some of the features with the Midland GXT1000VP4. You can get 2 miles of range at best in the woods. The channel scan feature is automatic and checks channels for activity. An auto squelch feature will help to remove the annoying background noise when you’re talking. The radio can tune into NOAA channels to keep you updated with the latest weather conditions and an alert system to warn you of the impending dangers such as fires or other disasters in your area. This two-way radio can alert you to incoming calls. When you're busy, toggle the keypad lock function to safeguard your settings. Unlike other radios, this one lacks some of the most useful features. For instance, it doesn’t have privacy codes where you can ‘privately’ interact with the people in your group. Also, it doesn’t have VOX or headset jack which would have facilitated a hands-free operation. The LXT535VP3 is powered by a rechargeable NiMH battery or by four disposable AAA batteries. There’s also the high and low power options. Every package of this pair is included with a charging dock, AC adapter, belt clips, and rechargeable battery packs. This is one of your best choices if you only want to buy a single radio. This can meet your expectations at an economical cost. The UV-5R operates on a maximum output of 4 watts and can provide up to 128 programmable channels. It features both VHF (136-174 MHz) and UHF (400-520 MHz) as a standard HAM radio. The radio can attain 65-108 MHz as an FM radio to catch the latest news updates or for music. All of these frequencies can be scanned automatically. The UV-5R can be difficult to program. It requires a USB programming cable which is sold separately and an open source CHIRP software. Baofeng radios are recommended to be programmed so that both the complete receive and transmit frequencies to coincide with the repeaters of the channels in memory mode. There’s also an option for private talks through privacy codes or CTCSS manual input. It also features a VOX and headset jacks for hands-free operation and has a built-in flashlight. Li-Ion battery powers the radio and there's a power option between high and low. The radio comes with a belt clip, removable antenna, C-ring earpiece with PTT mic, charging dock, AC adapter, and a wrist wrap. 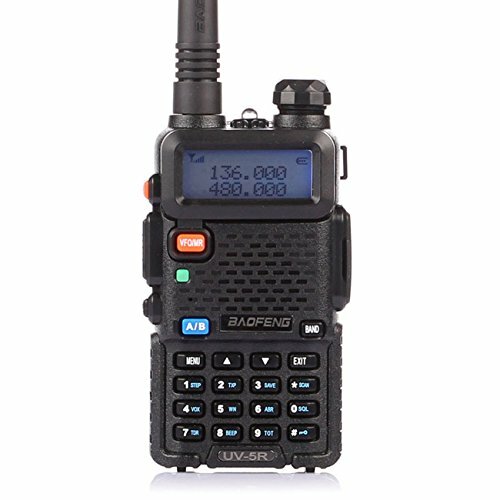 The UV-5RA is a variant of the Baofeng UV-5R with differences in style, color, firmware, etc. Just like the latter, the UV-5RA is a two-way radio you can count on at a low cost. This radio is a dual band covering both the 2 m and 70 cm bands. You can choose between two power levels, 1W and 4W to browse frequencies at 136-174 MHz and 400-480 MHz. The radio can also be an FM radio for news updates and music. There are 128 programmable channels or memories. Programming the radio through the front keys would prove to be tough. It's best to buy a USB programming cable that is sold separately and download the CHIRP software to ease the process. 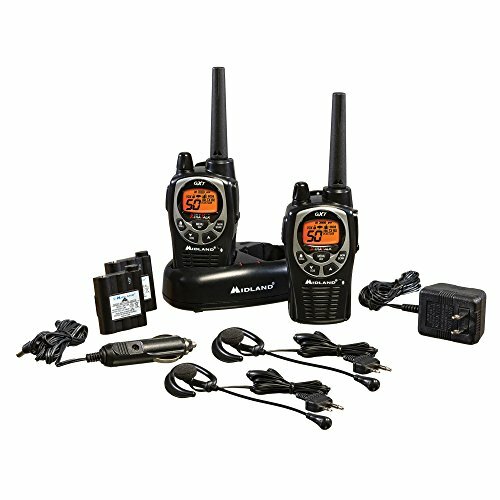 Other features of the UV-5RA include the synthetic English voice that sounds realistic, LED flashlight, headset jack, DCS/CTCSS programmable privacy codes, auto-scan feature, built-in key lock, and VOX (9 levels). Just like the UV-5R, this radio uses the same power source and the same accessories that come with the radio upon purchase. A radio is an essential gear that must be common to people who spend a large time outdoors and those who come in groups. The guidelines we’ve established in this article give you a general idea on what a two-way radio should be like. 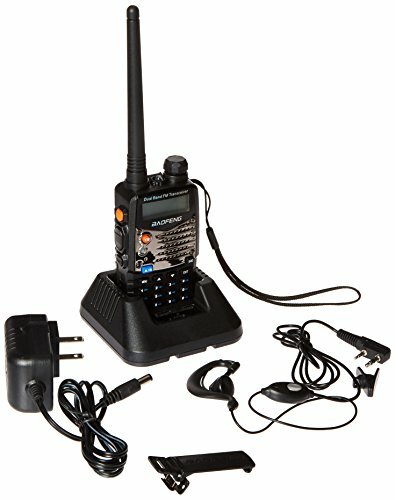 You can greatly rely on the best two-way radio you've chosen to continue communicating even if you’re far away or when in a tight spot.